Whatever you’re looking for, Dove products provide you with the care you need, tips and advice ranging from hair care, to skin care, to underarm care, everything you see here with Dove is designed to make you feel beautiful. The key to beautiful skin is every day moisture and, with the right moisturising Dove product you can make caring for your skin your daily routine. When choosing to use any of our Dove products you will be delighted with the product. Dove has created a new alternative to shower gel, now Dove has a shower foam range. Our pampering shower mousse wraps your body in a creamy lather infused with natural oil. Choose to transform your shower with our new Shower & Shave Mousse. 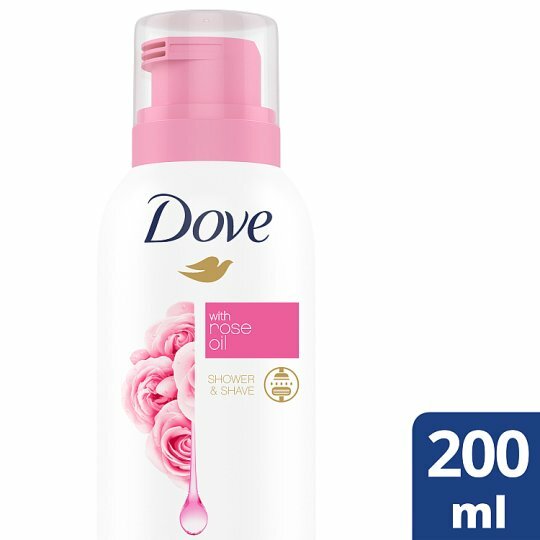 Dove has created a Dove Rose Oil Shower and Shave mousse. Our Shower & Shave Mousse prevents dryness by instantly restoring skin’s natural moisture barrier. Skin so nourished and soft, it glows. A shower mousse that is perfect for cleansing and shaving, one press goes a long way. When using our Dove Shower Mousse, shake well before each use. Use only as directed. Do not spray near eyes. If you get some shower mousse in your eyes, simply rinse thoroughly with clean water.